Ideal for all skin types, Centifolia Organic Moisturizing Body Lotion is an essential treatment to have in your body routine! Rich in aloe vera, it hydrates your skin deeply. Cocoa butter with nourishing properties soothes the skin and relieves certain irritations. Thanks to the natural assets of this biological care, it is suitable for even the most fragile and sensitive skins. Easy to spread, its light and non-greasy texture penetrates quickly. Your skin is perfectly hydrated and soft. Thanks to its family size, Centifolia Organic Moisturizing Body Lotion can be used by the whole family! 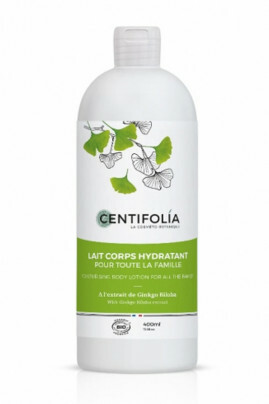 Centifolia Organic Moisturizing Body Lotion is suitable for all skin types! Morning and / or evening, apply the care on your body while massaging gently. A formula rich in biological assets to moisturize your body naturally! Aqua, Aloe Barbadensis Leaf Juice*, Glycerin, Butyrospermum Parkii Butter*, Helianthus Annuus Seed Oil*, Dicaprylyl Carbonate, Glyceryl Stearate Citrate, Cetyl Alcohol, Theobroma Cacao Seed Butter*, Caprylic/Capric Triglyceride, Ginkgo Biloba Leaf Extract*, Oryza Sativa Hull Powder, Biosaccharide Gum-1, Glyceryl Caprylate, Microcrystalline Cellulose, Cellulose Gum, Xanthan Gum, Citric Acid, Sodium Hydroxide, Sodium Anisate, Sodium Levulinate, Dehydroacetic Acid, Sodium Benzoate, Potassium Sorbate, Parfum, Benzyl Alcohol, Limonene, Linalool, Citronellol, Citral.